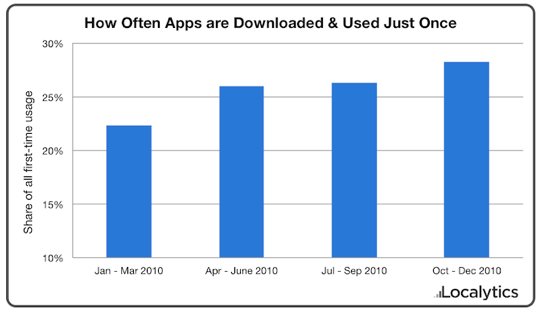 A new study from Localytics has shown 26% of all apps are only opened once after being downloaded. With half a million apps available across the iPhone and Android platforms it’s no wonder that App developers need to make a good first impression in order for their App to have any kind of lifespan. The research was taken from thousands of users from Android, iPhone, iPad, BlackBerry and Windows Phone 7 apps. So this trend is not isolated to one manufacturer or OS. Although these results are not particularly surprising, they serve as a warning to any brand looking to develop and App purely because everyone else seems to be doing it.. Unless the App is instantly useful, entertaining or relevant to your audience it may be very easily forgotten.